Frederick Omega Jordan was born on December 28, 1854 in Monterey County, California near the San Juan Bautista Mission in the town of San Juan where his parents John and Eliza Jane Jordan built a hotel and a store. Fred spent his childhood in San Juan. Fred was three years old when his parents moved to Tulare County, California in 1857. They lived ten miles east of Visalia. He was too young to he much help in making their home in San Juan. Fred was eight when his father, Captain John Jordan was drowned in the Kern River. He helped his mother, Eliza Jane as much as he could. As the years went on, he and his older brother, Tom, herded sheep for Mr. Brooks, a sheep man in the Yokohl Valley. He did this for some years to help their mother with the money and to hold their home together. He did go to school in the winter months and helped with the chores at home. He was very close to his mother, looking after her and standing ready with a helping hand. Fred was quite a mineral man, always looking for minerals. He made several trips up to the gold mining country, making a little money most of the time. He was also a crack shot with the old muzzle loading rifles and as the new repeating rifles came in, he got proficient with them. He killed most of the game for the family. There war plenty of game of all kinds in those days. Fred made several mining trips over in the Panamint mountains and in Nevada Territory. On one trip, he took his younger brother Jim with him. The Indians were on the warpath and they had some close calls or encounters with them, but the boys always stood their grounds. They came back home without striking it rich in gold, but rich in experience. Frederick Omega Jordan married Sarah Jane Tennessee Bailey on May 4, 1881, at Farmersville, California. They were married by T. J. Brundage, the justice of the peace of that town. After his marriage, he farmed between Farmersville and Visalia for a few years. During that time, their first born, James Franklin arrived January 20, 1882. Their second child Ethel was born on May 10, 1884. Shortly thereafter he moved his family to Kern County where he filed on a homestead of 160 acres. There the family settled down and built their first home of their own near the town of Delano. They had to travel to Bakersfield for supplies and to attend to what business they had. The country was flat without any trees, and one could see in all directions as far as the eye could see. They called their farm the "Need More Farm." They farmed grain and grew potatoes and some livestock. Fred did hire out with his teams and worked for the large farming company, Car and Hagen. As the years passed, they had two more children, Rosie Ellen who was born on May 26, 1887 and Charles Stephen who was born on September 16, 1891. 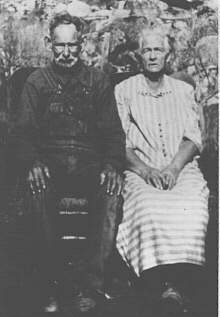 Fred and Tennie sold their homestead in 1894 and moved their family up to the northern part of California near Mt. Shasta where Fred engaged in gold mining. He worked that mine for several years making a little money. He moved his family back to Tulare County and settled up in the Yokohl Valley in the late winter. Fred and his brother, Bill opened a gold mine on Bill's ranch. Fred was in charge of working the mine for some time until the vein of gold ran out. Fred did more mining in different places in and around Yokohl Valley. In early 1906, Fred moved his family and located on the Fresno River in the eastern part of Madera County. This land belonged to their daughter Ethel Jordan Foster. Here they built their last home. 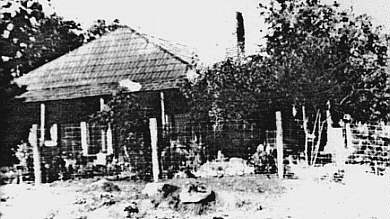 This is Frederick and Sarah Jane Jordan's last home on the Fresno River in Madera County, California. They built their home about 1908. They had a large natural spring of water nearby and they had a large garden every year. Their family by now was mostly grown and Fred spent many years mining, working the county roads with his teams, raising some livestock, and always raising a very good garden which was irrigated from a large spring. Fred attended a Jordan Reunion in the late '30s which was to be his last attendance. He enjoyed himself very much and was a constant talker, never running out of words. Sarah Jane Tennessee Bailey Jordan died July 4, 1935 and Frederick Omega Jordan died December 9, 1942.